Here's a fun cookie recipe which kids will love to join in with too. Ready to Roll Fondant Icing is just like edible play doh and children will enjoy mixing up some colors to make a brilliant marbled fondant to decorate the butterfly cookies with. Learn How to Decorate Butterfly Cookies with Fondant Icing on this page. 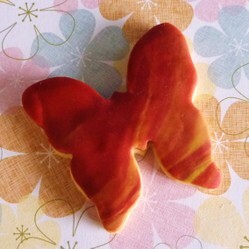 Marbled Fondant Butterfly Cookies are easy to make. Simply choose your favorite vanilla cookie dough recipe or use mine and then make up some pretty fondant icing which isn't hard when you use the ready to roll variety. Come and see what beautiful butterfly cookies you'll be making. Surprise someone with these beautiful marbled butterfly cookies as a pretty and delicious Easter or Spring gift. These cookies are very easy to make and if you have any child helpers in your kitchen, get them to join in and make the marbled fondant icing for you which they'll love playing with because it's like safe-to-eat and yummy play doh! Your finished iced butterfly cookies will be firm on top when complete and are not sticky. That makes them easy to pop into a clear cellophane wrap which is tied with ribbon for a pretty Easter surprise. Spring butterfly cookies draped in a marbled fondant icing. Easy to make and even easier to eat! 113g unsalted butter • 113g caster sugar • 1 beaten egg • 1/2 teaspoon vanilla extract • 225g plain flour • Ready to roll Fondant Icing • Apricot Jam - small amount for adding fondant. Measure out the sugar and softened butter into a large mixing bowl and mix them together. I use an electric whisk to do the hard work for me. When they are nicely mixed together, add in the egg and vanilla extract and whisk or mix again. Add the plain flour to the bowl and mix this all in too. If you use an electric mixer, you'll now have a crumbly dough mix in your bowl. Now's the time to get your hands in and squeeze all the mixture together to make a nice, firm dough. Push the dough together into a large ball shape, cover in plastic food wrap and pop in the refrigerator for approx 30 minutes before cutting your butterfly shapes out. Once the dough has been chilled in the refrigerator, you need to roll out the cookie dough. I never attempt to roll the whole amount in one go but prefer to take half of the dough and roll that out onto a large, flat surface. Whatever thickness you roll your dough out to is pretty much the thickness they will be once cooked. I aim for around 5mm thick. Cut out your butterflies from the dough and put them onto lightly floured baking trays. Bake the butterfly cookies on Gas 4 (350°F / 177°C) for around 10-12 mins. They should be a nice golden brown color. Then pop them onto cooling racks and get on with making your fondant icing while they cool down. Ready to roll fondant icing such as Regal-Ice is pre-colored and very easy to use. I'm not sure on the quantity that you'll need because that will vary but I generally use two colors to make the marbled icing and a large, fist-sized, amount of each one. Follow the instructions for the fondant on the packet. I buy individual packets which I warm up between my hands before removing the fondant icing onto a surface that's got a sprinkling of confectioners' sugar or Icing sugar as we call it in the UK. Take an equal amount of two colors of fondant (I used red and yellow) and squash them together into a ball. Twist the ball of fondant in your hands and roll out. You should get a nice marbled effect. If the effect isn't what you hoped for, then simply scrunch it all up and roll again to a thickness you'd like to eat. 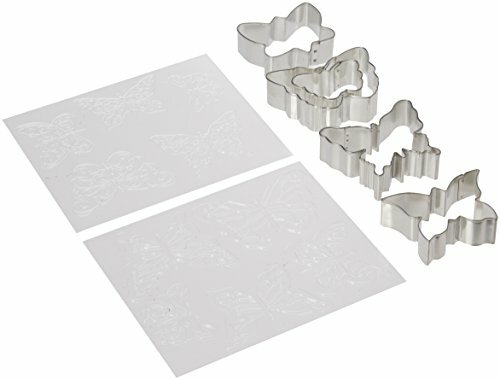 Grab your butterfly cutter and cut out your butterflies from the marbled fondant you've just made. Make sure you have some confectioners' sugar or icing sugar sprinkled underneath the fondant icing otherwise it might stick to your work surface. Warm a small amount of apricot jam, about 1 tablespoon, in a small microwaveable bowl for about 10 seconds. Use a teaspoon to carefully spread a very tiny bit of jam onto a cooked butterfly cookie. You want just enough jam to make a fine layer over the top. 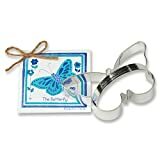 Place a blunt knife under a cut fondant butterfly and place it over the top of the cookie and press lightly into place. Set on a tray to dry and you're done. I hope you've enjoyed reading my wizzles page today, thanks for your visit. Enjoy your yummy butterfly cookies! Need a US Cookie Recipe? This Page Won an Award! Will you make some Marbled Fondant Cookies? Every eye catching. They are edible? They look mouth watering. These look so beautiful, it's almost a shame to eat them. On the other hand, if only my hand could reach through this screen! Yum! 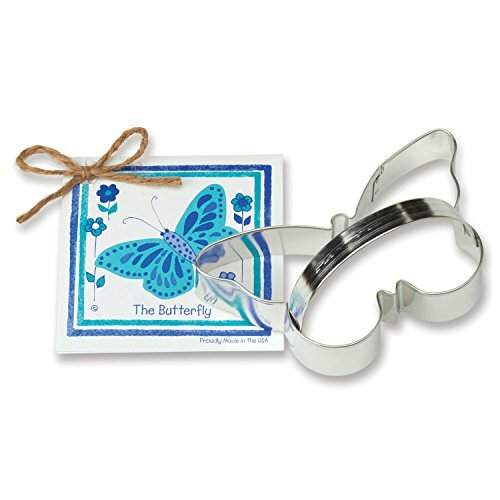 Thank you, BalletGifts :) I enjoy doing a lot of butterfly crafts during spring time. 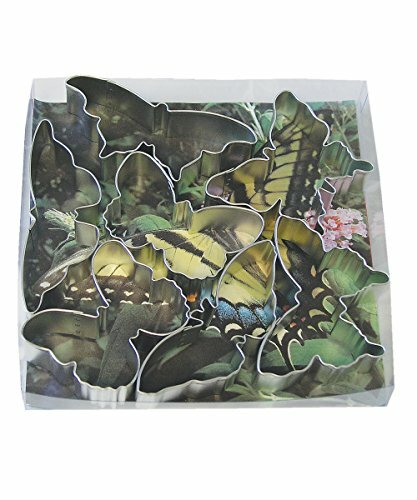 I'd love to make some, these butterflies are just so pretty! Perfect for this time of year. These look really fun to do . Must get my grandkids involved! Thank you so much @nightowl and how lovely to get an Editor's Choice award too. We are making more of these for Easter but my daughter's chosen a bunny cutter instead.